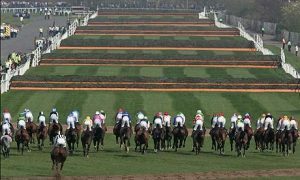 The three-day Grand National Meeting is staged annually, in April, at Aintree Racecourse on Merseyside in North West England, although the exact date depends on when Easter falls each year. Following, as it does, hot on the heels of the Cheltenham Festival with, typically, three or four weeks between the two prestigious meetings, National Hunt enthusiasts have little time to recover before putting their emotions through the wringer once again. The Thursday of the Grand National Meeting, a.k.a. Liverpool Day, has been described in some quarters as the ‘calm before the storm’ but, while the attendance is definitely lower than on the Friday or Saturday, a crowd of around 35,000 is not uncommon. Of course, the Grand National Meeting also kicks off with four Grade 1 races in a row, the Aintree Manifesto Novices’ Chase, the Betway Bowl and the Aintree Hurdle, so the adrenalin is pumping even before the first race of the week over the National fences, the Fox Hunters’ Chase, later in the afternoon. The Friday, a.k.a. Ladies’ Day, too, features more Grade 1 action, in the form of the Mildmay Novices’ Chase, the Aintree Melling Chase and the Sefton Novices’ Hurdle, which are run on either side of the feature handicap, the Topham Chase. Inaugurated in 1949 and named after the late Mirabel Topham, former owner of Aintree Racecourse, the Topham Chase is run over 2 miles 5½ furlongs or, in other words, one circuit of the National course. The Saturday, a.k.a. Grand National Day, is all about the most famous steeplechase in the world, the Grand National. Inaugurated in 1839 and, nowadays, officially run over a distance of 4 miles 2 furlongs and 74 yards – reduced by a furlong after re-measurement in 2016 – the Grand National remains one of the toughest tests ever devised for horse and rider. To win the most valuable steeplechase in Europe, horses must negotiate thirty spruce fences, including household names such as Becher’s Brook, the Canal Turn and the Chair, and the famously long, 494-yard run-in between the final fence and the winning post.